Dear mummy, it’s not everyday you get really excited about something. Today is the day my little package turned up in the post. A small pink box with my name on it! Wowee mummy, a parcel for little ol’ me! We’re going to be trying out the new flavour of Angel Delight…and this is why you are so excited. It’s not the Strawberry or the Chocolate or the Banana…or even the Butterscotch flavour…..it’s BUBBLEGUM! Weird? You may think so and this is why we are testing it out. So what is Angel Delight? It’s a quick instant dessert, you add the flavoured powder to fresh milk, leave it to set and Voilà! It only uses natural colourings and is suitable for vegetarians as well. Families around the country have been enjoying Angel Delight since 1967 (That’s before you were born mummy! A long, long time ago…when the dinosaurs existed!) I can’t imagine what the cavemen would have used to whip up their Angel Delight? A T-Rex bone? You inform me that actually it wasn’t THAT long ago. Opps. Anyway, as I’m only a baby, we enlist the help of my friend Jeremy to help mix and prepare the Angel Delight. But we find he’s as much use as a chocolate teapot as he’s a stuffed animal (Shhhh don’t tell him I said that, as he’ll get upset) So Jeremy will hold the Angel Delight and model the product placement instead. Mummy tells all my other toys that there will be a tea party after we make the Angel Delight, so I grab all my cups and saucers and get ready. Mummy makes the Angel Delight while I look on, pouring in 300ml of milk into a large glass bowl and hand whisking it. She doesn’t spend long whisking the mixture until it become light and fluffy. The magic dust (AKA the bubblegum Angel Delight powder) fills the room with a lovely smell which reminds me of the fairground. It’s a sweet smell and reminds my mummy of when her Grandma used to make Angel Delight for her….back in the day! 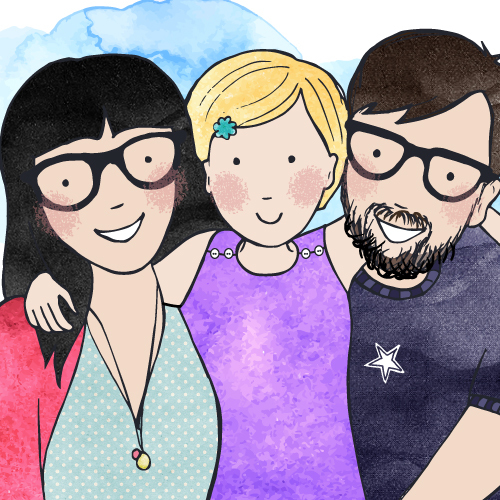 My mummy’s favourite flavour is Strawberry, she’s not too sure of the bubblegum flavour…however my Daddy loves it! Leaning over and swiping a finger in the bowl and smacking his lips. YUMMY! I’m still not impressed at my mummy and daddy mucking around, and stomp impatiently. Surely it’s time to have some now??? Mummy pours the fluffy mixture into a Sundae Glass and a Banana Boat and pops it into the fridge to set. It doesn’t take long, within 5-10 minutes its set. I don’t think Jeremy and I can wait, so we lick the bowl when mummy’s not looking. We set up our tea party in the front room and I invite my toys over to play. 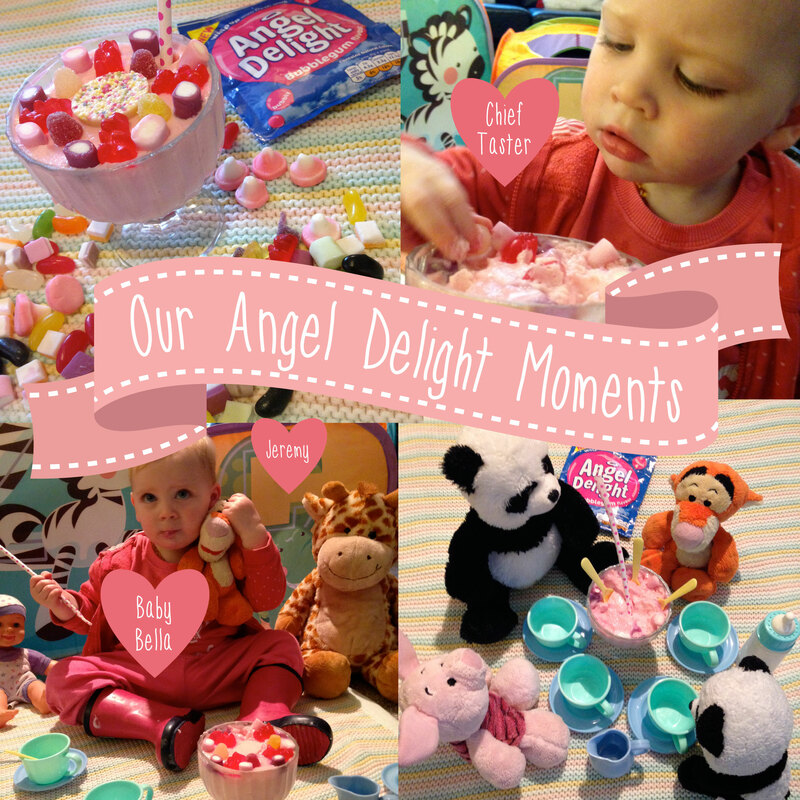 We decorate the Angel Delight puddings with sweets….I think I’m in heaven, and so does Daddy….I swear those Haribo adverts were based on him! He has the biggest sweet tooth in the world. Tah Dah! It’s finished. 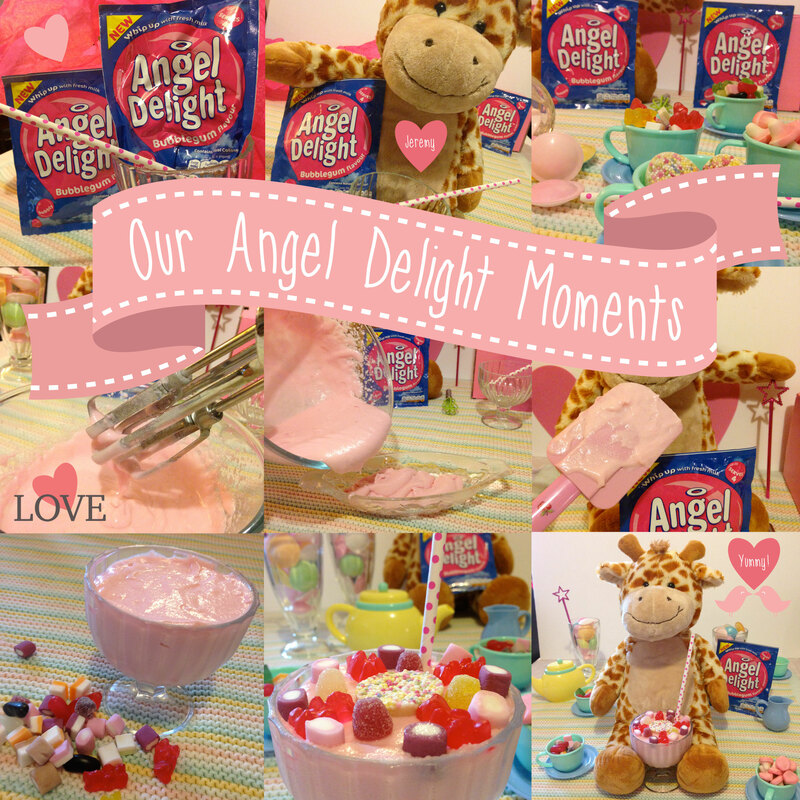 We all dig in and enjoy the Bubblegum awesomeness that is Angel Delight.